Joz Norris is a brilliant character comic who is performing his FREE show Joz Norris Has Gone Missing at the Blind Poet during this year’s Edinburgh Festival. 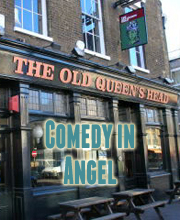 He’s very kindly agreed to blog his experiences at the Fringe for Laugh Out London. We are sure you shall find him charming beyond belief. DAY 1, 23:00 – I have safely arrived in Edinburgh. It is a few days before the start of the Edinburgh Festival Fringe. Everybody is assembling things, all over the city. Everywhere you look, things are in a state of unreadiness. A banner is being put up above the Royal Mile. I think when it’s finished it will say “Here Be Monsters.” Nobody is panicking yet, but everybody seems to­ be wearily resigned to the month to come, especially the locals. After getting myself settled, I head over to Bob’s Bookshop for the launch party. Bob Slayer and Joe Davies and Luke Chaproniere have been busy all day putting up shelves. The launch party was really buzzing and I enjoyed a good few beers that night, I can tell you! Here is a picture of the atmosphere at the launch party. It turned out everybody was waiting for me to go away before turning up, and as soon as I left I heard a great cry of delight from all the partygoers who had hidden in the toilet, a bit like that moment in Notting Hill only crueller. Still, not before I managed to get a picture of me and Luke really letting our hair down at the party and living it large, Edinburgh style! DAY 1, 00:00 – Well, it seems that already the Edinburgh life has turned into a right party animal! Not content with all the fun we had at Bob’s Bookshop, Luke and I trundle down to a public house across the way where we boogied the night away for at least another half hour. The highlight of the evening was definitely the hilarious moment when Pat Cahill trod on Karl Schultz’s foot. Karl proceeded to tell me how I could sleep with all the women in the room, and opened my eyes to an important revelation – apparently all it takes to seduce a woman in a public place is to wave at her from the other side of the room. I tried this and was politely asked to leave, and Karl had to explain to me later that in order to wave successfully I have to open my palm flat, not clench it in a tight fist. You live and learn! All this excitement was a bit too much for me and it was off to bed.